Protech's log manifold is the finest, hand-made log manifold around. 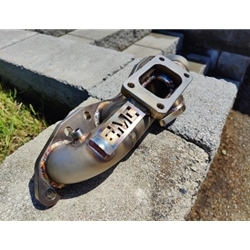 Available for SR20DE and SR20VE, the manifold can be made in T2,T3 or even T4 flanges. Available coated in Bright Silver, Flat Black, or Cast iron gray finshes. Comes standard with 38mm wastegate flange and EGT bung. Custom options and even down pipes available too!